Cottage Prep – It's good to be home. The day I saw this house for the first time, this addition was what sold me. I knew it had the potential to be more than the neglected, dog-chewed room that it was. Behind the wall of cabinets were the stairs to the “creepy basement.” I knew some day I wanted this space to be a bathroom. But, as this house had one, single closet, we turned this space into a makeshift closet. Klassy. …but better still, a bathroom! During The Hubs staycation this year, we added the finishing touches: beadboard wallpaper, moldings, and lots of color! 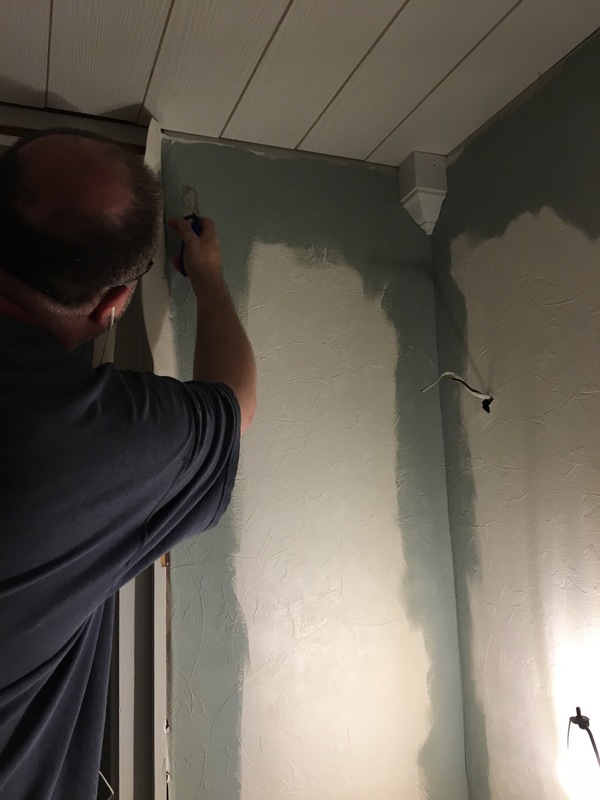 The walls were already painted in Sherwin Williams Glimmer, so we just refreshed them. 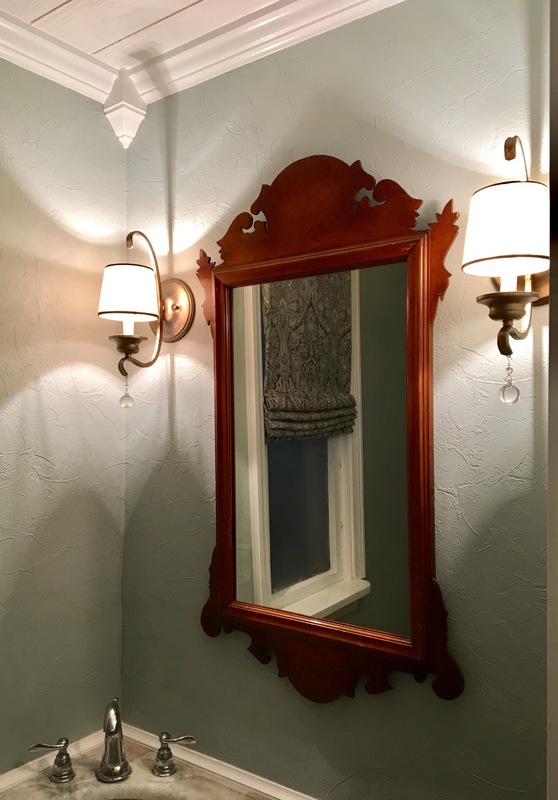 The vintage mirror was painted in Amy Howard One Step Paint in Dunavant Green. It is such a happy, cheerful space now, and I love it. If you ask me my favorite style of decorating, I’ll say, “Cottage with a beachy, farmhouse, modern, mid-century twist of contemporary, vintage eclecticism in a minimal, maximum approach.” In other words, I pretty much love it all. On one hand, my love of everything is wonderful. I see beauty everywhere. I could search for random color palettes on Pinterest for hours. I can see a beautiful pink room and swear I want everything in my house pink…until I see a pale green or teal or orange or blue room and say the same thing. That’s the dark side of this love of everything–decorating ADHD. In the last year, I began the process of focus and cohesion by painting most of the downstairs in Sherwin Williams Tidewater and Glimmer. (They are varying intensities of the same color.) Tidewater is a blue green that is both deep and soft. We’ve had a fairly gray winter so far, and I haven’t had a hint of the winter blues with this color on the walls. It’s a happy color! For the foyer (above) I had Tidewater mixed at 50%. This gave me a shade right between Tidewater and its lightest counterpart, Glimmer. In the morning, this room is absolutely magical! This room then flows beautifully into the living room/dining room which are painted in Tidewater or into the kitchen which is painted in Glimmer. Landing on this wall color was a big step toward peace and purpose for me. My kitchen in the morning is one of my favorite places to be. Sunlight is streaming in, reflecting off the snow outside. The beauty in this moment takes my breath away. It’s 14 degrees outside, but I am warm and cozy as I sit at my breakfast nook. The L-shaped banquette bench was built over the baseboard heaters, ensuring that my buns stay toasty as I sip my morning coffee. Our contractor really did an excellent job on them. See that pen cap by the bench? (It’s just to the right of the dirt and the dog hair.) It landed there during dinner last night. Beanie was playing with a pen, and that piece shot off, hit me, and landed right there on the floor. We laughed and laughed at her reaction! My favorite people gathered around my favorite place enjoying a simple dinner and each other’s company, another blessing that I cannot soak in enough. 2017 was tough. I had one of the worst stretches since I was diagnosed with hemiplegic migraines six years ago. I had a scary reaction to a new medication, but my neurologist was quick to make a change again. After all of that new medicine was out of my system, I felt reborn. A bump in one of my oldest meds gave me some pain free stretches, and I brought out the paint again! Bathroom, kitchen, some furniture! I admit, I overdid it, but how wonderful was it to create again! An HM attack hit me during The Hubs holiday party for work, and I’ve been limping along (literally) ever since. This is one reason why home is so important to me. It is a sanctuary where I can hide when I feel bad and a canvas where I can create when I feel better. In 2018, I want to focus on peace and purpose in my home. Yep, that probably means cleaning and decluttering before decorating. Stress is a big HM trigger, so this also means cleaning and decluttering myself too. Isaiah 26:3 says, “You will keep him in perfect peace, whose mind is stayed on You, because he trusts in You.” I have My Utmost for His Highest and a couple of the Love Dare books to read through. I’m ready and willing. Wishing you peace, purpose, and joy in your home in 2018. As much as he protests, The Hubs enjoys demolition. He’s like a machine. 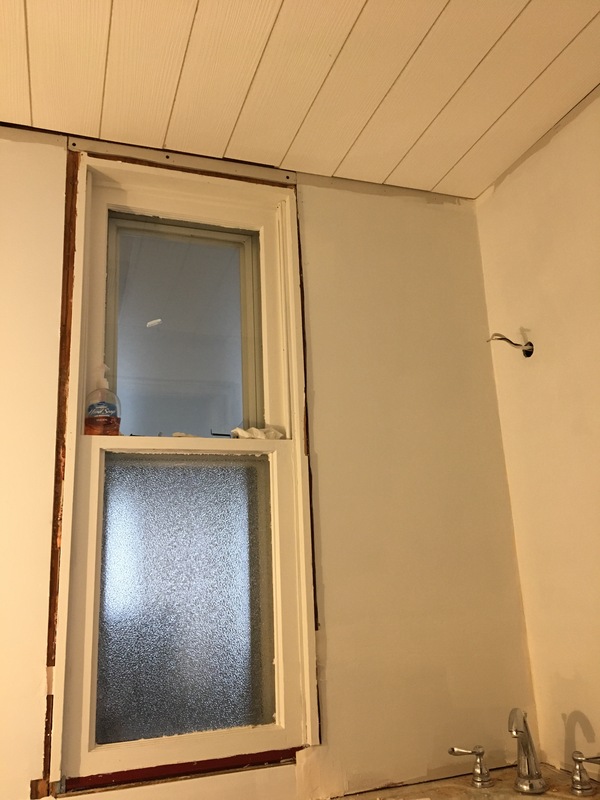 It was a joy to behold as I ducked around flying trim, paneling, and acoustic tile. The one thing The Hubs did not want to DIY was the toilet. He changed out the upstairs toilet last year and decided to keep his day job. I, on the other hand, only handed him tools during that little project, so I was game to DIMyself. 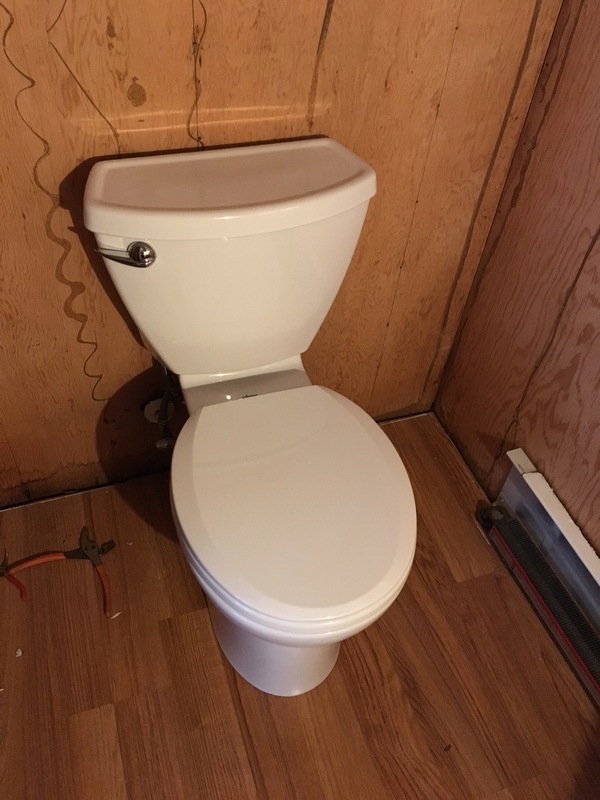 First rule of potties in old houses–understand that there is a reason that the previous owners did not update them. Second rule–never assume that you can just waltz into Lowes, pick out a toilet, and install it in an old house. I learned that the hard way. After four stores and lots of frustration, I found the only toilet in the greater metro area that would fit in this bathroom. And my kids and I installed it! Next up was the ceiling. Oh how I hated that nasty patched ceiling! 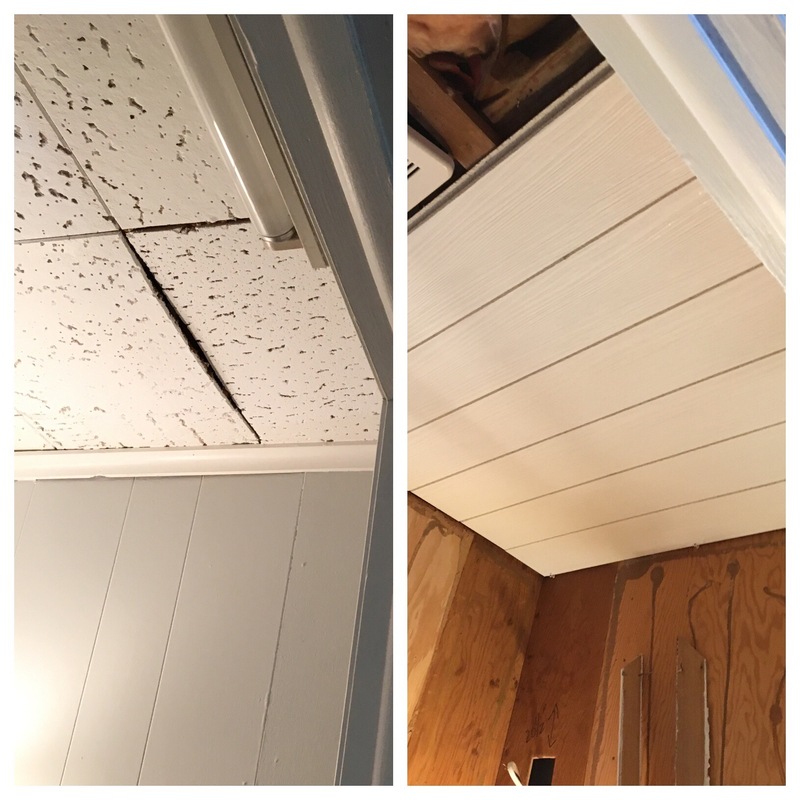 I found a great ceiling product at Lowes–Armstrong’s Plank Ceiling Tiles. These were all kinds of easy to install with some acoustic tile adhesive and a staple gun. I love the way they look! See that fan? It WORKS! 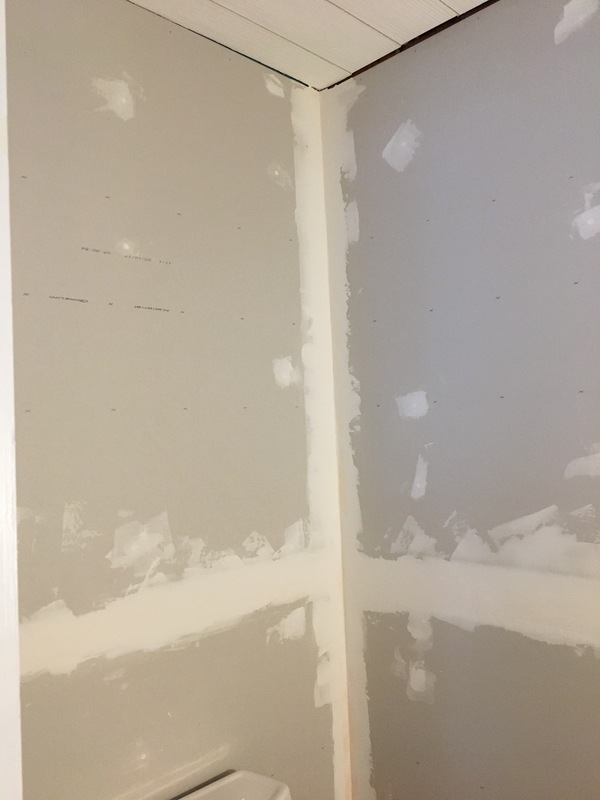 Next came drywall. I’ve patched a bit of drywall in my time, but this was the first time The Hubs and I have ever really hung it. To be honest, he did all the cutting and measuring. I got to mud and tape. We won’t speak of this process. We will just cover it with paintable, textured wallpaper and call it a fashion choice. Next came the wallpaper (nope, not hiding anything at all here), paint, and trim. This little window was a major problem. It looks directly into our sunroom. (Oh random, ugly little window, how I hated you!) Not only was the view horrible (from both sides! ), this was truly an ugly little window. It had no trim, no charm, and I pleaded with The Hubs to drywall over it. Now I am so glad that he won that argument! The Hubs had to do some creative cutting make the new window trim fit with the crown molding, but I love the result. I knew I wanted a roman shade for the window. Of course, another rule of old houses is that modern window treatments rarely fit old window, and anything custom comes at a custom price. As an alternative, I cut a ready-made window panel to the right length and width and created a No Sew Faux Roman Shade. The window isn’t functional anymore, so the shade is simply stapled in place. It is sturdy enough to be lightly vacuumed when it needs it. There are a few more little projects to complete, such as the sink skirt, repainting the baseboard heater, and refinishing the door. But, such is the never-ending list in a wonderful old house! The patched acoustic tile ceiling, the ugly red paint, the wallpapered 1960’s paneling, the fan that didn’t work, the industrial fluorescent light over the door that served no purposed whatsoever, the cabinet that required a stepladder to reach. Yep. It was a stunner. 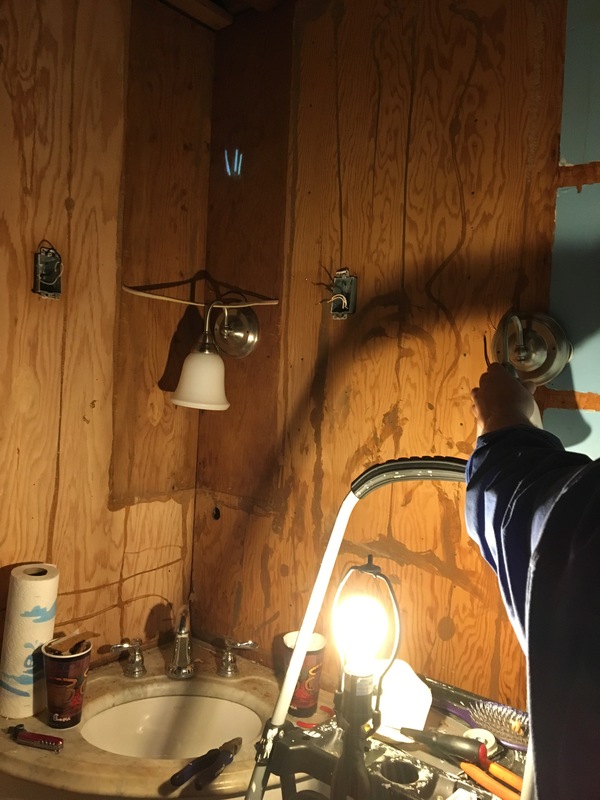 The outhouse light switch was a particularly nice touch. But, that antique corner sink held the possibility of redemption. Someday. With so many other rooms and house systems in need of updates, I gave this room a minor face-lift with paint and new lighting. 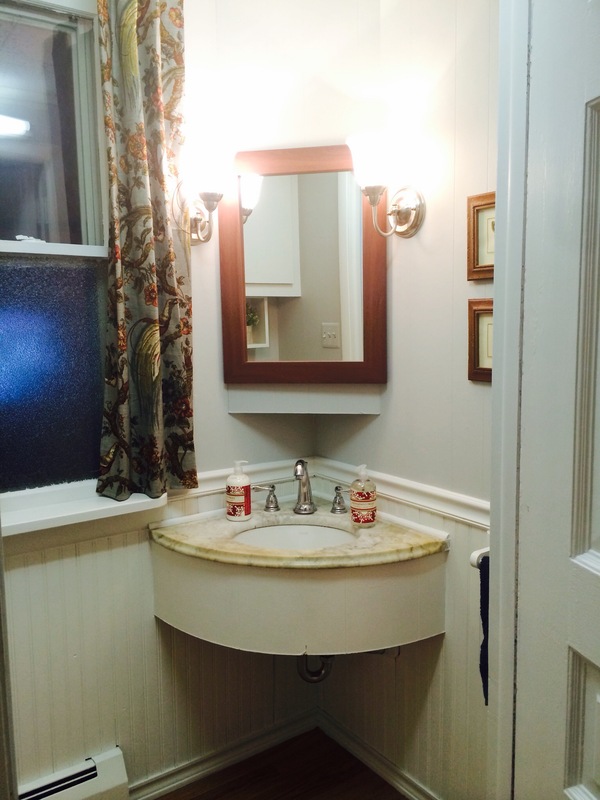 With the wainscoting now painted white, we realized that this room was an example of the previous owner’s DIDon’t. 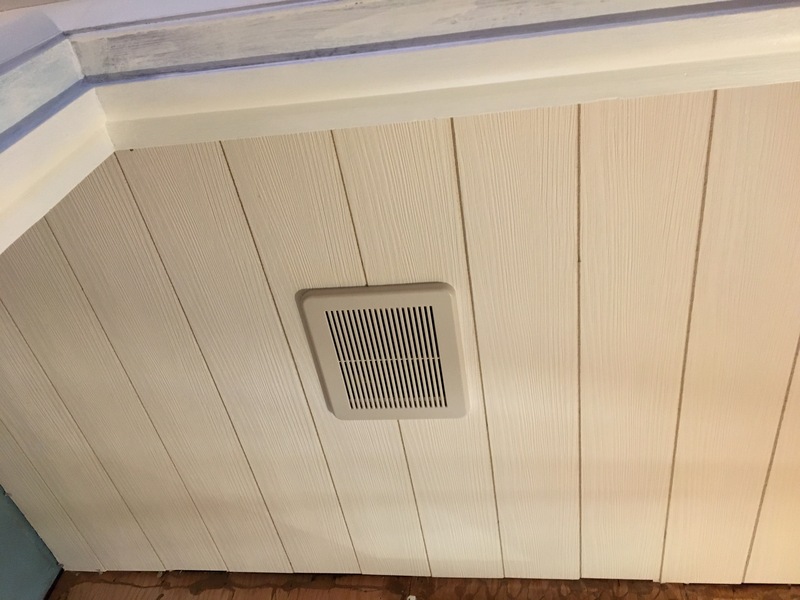 That innocent looking baseboard heater created huge gaps between the pieces of wainscoting when the heat caused the wood to expand. The red paint was dark enough to hide this little issue–white wasn’t so forgiving. I know. Underwhelming. Don’t leave yet. It will get better in Part 2!